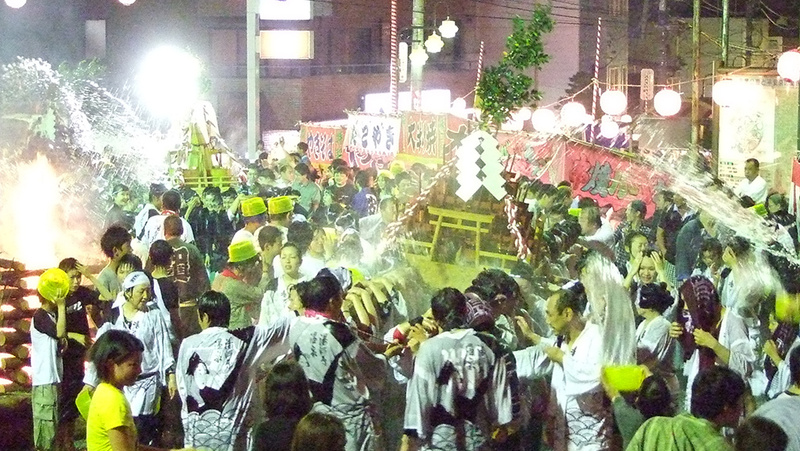 The “Hot Spring Water Sprinkling Festival” is a festival in which five mikoshi (portable shrines) parade the onsen streets for two kilometers. They start at Fudo Waterfall in “the Fujiki River,” continue past the upper stream of the Chitose River (that flows along the border between Kanagawa Prefecture and Atami City), and travel all the way to Izumi Park, all the while being sprinkled with “onsen water.” One of the portable shrines is carried by a group of geigi, and, ahead of it, is one mikoshi carried by women on the Women’s Mikoshi Experience Tour. The remaining three mikoshi are from local mikoshi societies. In the square in front of Yugawara Tourist Hall, which is the main venue, and Izumi Park, the portable shrines parade to lively songs, and hot water is tossed on a larger scale, creating a really powerful and impressive scene. 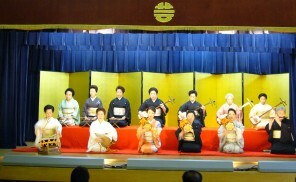 This festival is derived from the legend that, because of the powerful effects of Yugawara’s onsen water, it was packed in barrels and presented to feudal lords’ families and imperial villas during the Edo era. 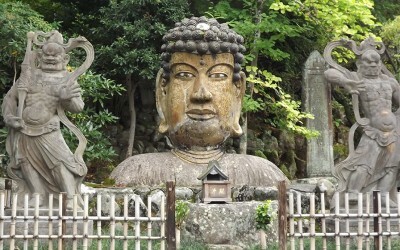 At present, people along the route are asked to toss hot water at the portable shrines with feelings of gratitude. 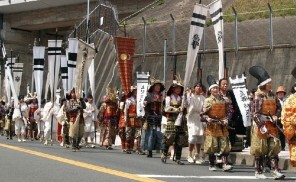 At the same time as the Hot Spring Water Sprinkling Festival, the “Chopsticks Festival,” in which thousands of chopsticks are burned, is also held as an old Shinto ritual to pray for sound health and huge harvests. Mikoshi parade: 7:00 p.m. – 9:30 p.m.
Take the bus for Oku-yugawara or Fudo-taki from Yugawara Station (about an 8-minute bus ride). Get off at Mitsuke-cho and walk for one minute. Due to the mikoshi parade, there will be changes in the bus operation schedule of the following buses. We ask for your understanding and cooperation. ◎The 18:18 bus for Oku yugawara and earlier ones will be operating normally. ◎From 18:33 – 21:15, buses will shuttle back and forth between Yugawara Station and Risokyo. ◎The 21:33 bus (for Fudo taki) and later ones will be operating normally. 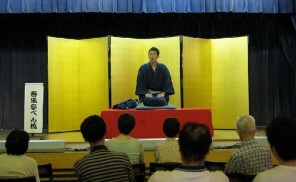 ◎The operation of the 21:48 bus for Fudo taki will be extended to include Oku yugawara. ◎The 18:28 bus (leaving Oku yugawara) and earlier ones will be operating normally. ◎The 18:43 – 20:30 buses leaving Oku yugawara will be out of service. ◎The 21:15 bus (leaving Oku yugawara) will have a time adjustment at Fudo taki. ◎The 21:40 bus (leaving Fudo taki) and later ones will be operating normally. Parking is extremely limited, therefore, it is recommended that visitors utilize public transportation. 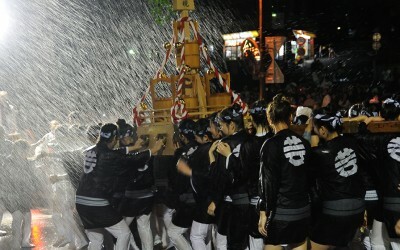 COME JOIN US for Hot Water Sprinkling Festival Mikoshi Experience Tour! 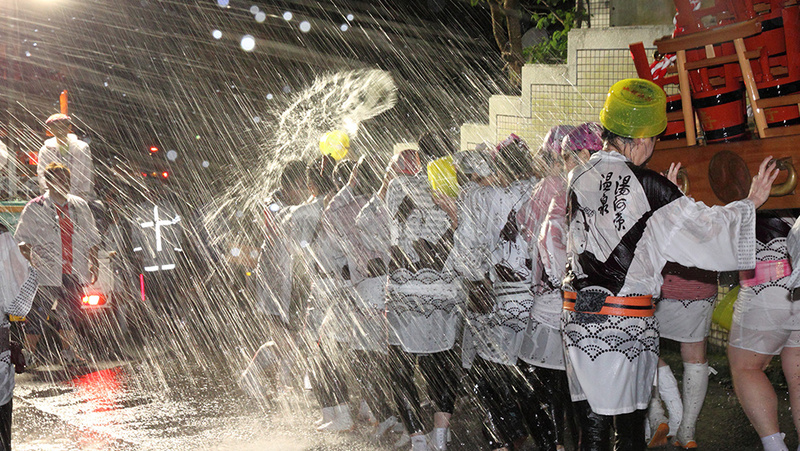 We are currently recruiting participants for the Women’s Hot Spring Water Sprinkling Festival Mikoshi (Portable Shrine) Experience Tour, in the hope that many women will carry the mikoshi at the Hot Spring Water Sprinkling Festival and create pleasant memories. 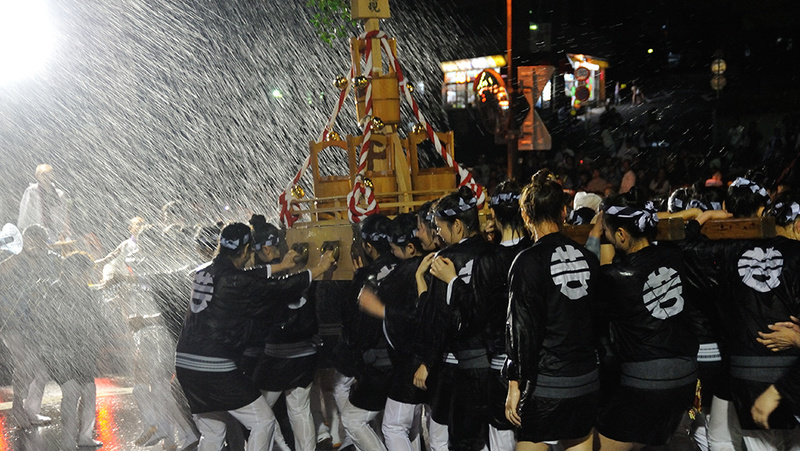 This tour, in which participants’ sweat from carrying the mikoshi in a lively way is washed away while enjoying an onsen bath together, in a relaxed and leisurely environment, cumulates in an overnight stay. 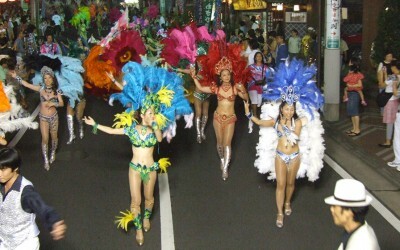 This event is in its in 21st year this year, and has enjoyed great popularity every time. Even if you have never carried a mikoshi, don’t worry! 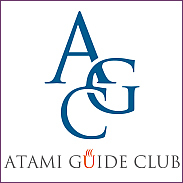 Members of the local mikoshi societies will show you how. 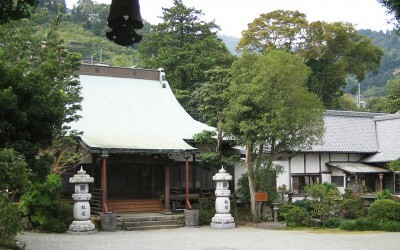 The Women’s Hot Spring Water Sprinkling Festival Mikoshi Experience Tour is unique to Yugawara and cannot be found in any other onsen resorts. We look forward to your participation. ※This is an overnight tour. We accept women only groups of two or more. ※Men’s applications are not accepted. Documents with details about the event can be requested by phone or FAX and will be sent out between late March and early April. Please make reservations using the form for inquiries and other documents. Yugawara’s geigis add grace and luster to banquets.